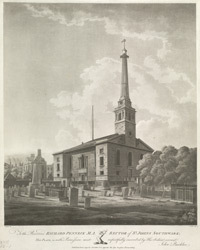 View of a church, described as St John's of Southwark, showing the churchyard. The artist is John Buckler F.S.A. (1796-1849) who was trained as an architect and also was an antiquarian draughtsman. He was a prolific artist and exhibited at the Royal Academy from 1796-1849. He drew many views of cathedrals and larger churches.